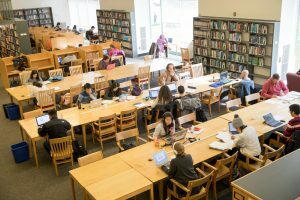 As recommended by the preliminary report of the Future of Libraries Task Force, Director Chris Bourg has convened an MIT Libraries Space Planning Group. The group, charged with making specific programmatic recommendations for the renovations of the Libraries’ physical spaces across the Institute, is chaired by Bourg and J. Meejin Yoon, professor and head of the Department of Architecture. The group will develop an overall vision for MIT’s library spaces as well as specific programmatic recommendations for renovations to Building 14 (currently home to Hayden Library, Lewis Music Library, the Institute Archives and Special Collections, Killian Hall, and offices and classrooms for the School of Humanities, Arts, and Social Sciences) and Building 7 (Rotch Library). Some renovations to Barker Library in Building 10 also might be required to realize the overall vision. The Space Planning Group expects to develop an overall vision for library spaces and programmatic recommendations for Building 14 by March 2017. The programmatic vision for Rotch Library and Building 7 should be completed by early 2018.